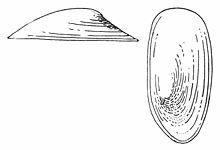 Acroloxidae, commonly known as river limpets, are a taxonomic family of very small, freshwater snails, aquatic pulmonate gastropod limpet-like mollusks with a simple flattened conical shell in the clade Hygrophila. Acroloxidae is the only family within the superfamily Acroloxoidea (according to the taxonomy of the Gastropoda by Bouchet & Rocroi, 2005). Pulmones are reduced. Sexual cavity and accessory gills are on the right side. This article incorporates public domain text from the reference. ^ Beck H. (1837). Index molluscorum præsentis ævi musei principis augustissimi Christiani Frederici. pp. 1-100 , 101-124 . Hafniae. ^ a b c d Kantor Yu I., Vinarski M. V., Schileyko A. A. & Sysoev A. V.(published online on December 22, 2009). "CATALOGUE OF THE CONTINENTAL MOLLUSKS OF RUSSIA AND ADJACENT TERRITORIES". Version 2.3. ^ Starobogatov (1989). In: Linevich (Ed.) Fauna Baikala. Chast' 4 - Chervi, mollyuski, chlenistonogie: sbornik nauchnykh trudov. Fauna of Lake Baikal. Part 4 - worms, molluscs and arthropods: collected scientific papers. Nauka, Novosibirsk: 58. ^ Lindholm (1909). Wiss. Ergeb. Exped. Baikal 4: 26. Wikimedia Commons has media related to Acroloxidae.